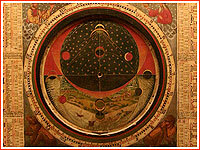 The geocentric system of the world, with the Earth at the center of the Universe, was as long lasting as it was flawed. Formulated in ancient Greece as a debatable theory, it was turned into a dogma by the church. Making the Earth the center of the Universe, the geocentric system had probably hampered the idea of space flight for 18 centuries. Before humans could achieve space flight or even start dreaming about it, they had to discover its possibility. The idea of flight was probably obvious to the earliest humans, from observing birds and objects carried by the wind. However, drawing an even approximate picture of the Universe with conceivable travel destinations required centuries of overcoming counterintuitive concepts. According to the 20th century historians, to a scientifically unarmed inhabitant of the pre-historic world, the Earth looked flat. The night sky was peppered with bright dots of light and the lonely flat disk of the Moon. There were no hints of other worlds' existence, let alone their similarity to the Earth. Those living on the shores of great oceans could justifiably see them as the edge of the world extending endlessly into the abyss. Yet, the Sun had a mysterious capability to make a night-long trip "underground" to the opposite side of the world and reappear over the eastern horizon every morning. Along with the movement of the Moon and stars, it had to prompt questions about the dimensions and shape of the world. Prehistoric structures like Stonehenge point to their architects' awareness of astronomical phenomena such as the movement of celestial bodies, however there is no sign of human investigation into the physical properties of the Moon, Sun or stars, until the rise of the Greek civilization. 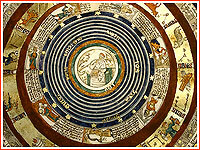 The Greeks borrowed extensive astronomical knowledge from the Egyptians and Babylonians, however unlike their predecessors, Greek astronomers managed to combine observations with an active and persistent effort to explain the origin and the design of the Universe through science rather than myths. The result was a startling string of discoveries, which gave humanity its first chance to see the world as it is. Another Greek thinker Anaximander (about 611-546 B.C.) is the first known challenger to the flat Earth theory. He speculated that the Earth was suspended freely at equal distance from all other heavenly bodies! Anaximander estimated the Moon's "orbit" to be 19 times the size of the Earth and the Sun's orbit 28 times the size of the Earth. He believed that the Sun is the size of the Earth. However, despite his brilliant estimates on the structure of the Earth and the Sun and their obvious globular shape, Anaximander described the Earth as a short cylinder, perhaps in the effort to explain the visible flatness of his home planet. Anaximander also made the first attempt to draw a map of the entire inhabited world. Merely a generation later, Pythagoras (born 572 B.C.) declared the Earth a sphere, and it is safe to assume, he also attributed a spherical shape to the Moon, Sun and stars. (347) One of Pythagoras' followers, Philolaus made the first, though awkward attempt to draw a true picture of the Solar System, by suggesting that the sky, the planets, the Sun, the moon, the Earth and the "Counter earth" rotate around the Central Fire. It seems the picture of multiple worlds with a finite distance between them and the Earth as an ordinary body among them could now be imagined. Even more remarkably, the debate about the possibility of other solar systems had also started in Greece. (148) With brilliant foresight, Democritus suggested the existence of multiple and diversely sized solar systems at different distances from each other! Despite an unproven believe by Aristotle about the impossibility of multiple worlds, Metrodotus echoed Democritus with a pointed metaphor: "it seems absurd that in a large field only one stalk should grow and in infinite space only one world exist." (213) Aristotle did make a good guess about layered nature of the Earth atmosphere, suggesting that only the lowest layer blanketing the Earth surface is suitable for life, while the next one was very cold and the top one was very hot. Finally, Aristarchus, working in Alexandria at the beginning of the third century B.C. essentially completed an accurate picture of the solar system by placing the Sun in the center and the Earth and other planets into orbits around it. (350) Aristarchus even attempted to measure the relative distances of the Sun and Moon from the Earth but apparently failed due to lack of technology. (213) In the meantime, an effort to measure the size of the Earth by Eratosthenes was a success for all practical purposes, despite some miscalculations. Thus, thanks to unprecedented and unhindered effort by the Greeks to understand the world, a monumental stage for space travel had been set, at least in the imagination of some enlightened individuals. 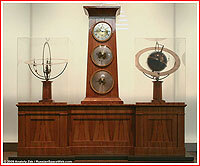 On the practical side, the Greeks' intellectual genius brought them to the brink of development of the steam engine, jet propulsion and even mechanical computation devices, even though economics and the technological level of the era could provide little stimulus for application of these inventions. Unfortunately, even in classical Greece, a heliocentric (Sun-centered) system was rejected by at least two prominent thinkers, Hipparchus and Ptolemaeus (Ptolemy). Despite their scientific foresight, both still preferred to cling to what seemed so obvious in the sky -- the entire Universe rotating about the stationary Earth. Ptolemy solidified that misconception in his summary of Greek knowledge about the Universe. His book would probably have been lost along with countless other works by classical authors in the turmoil of Dark Ages, if not for the efforts of a single ruler of the Arab caliphate in the 9th century. 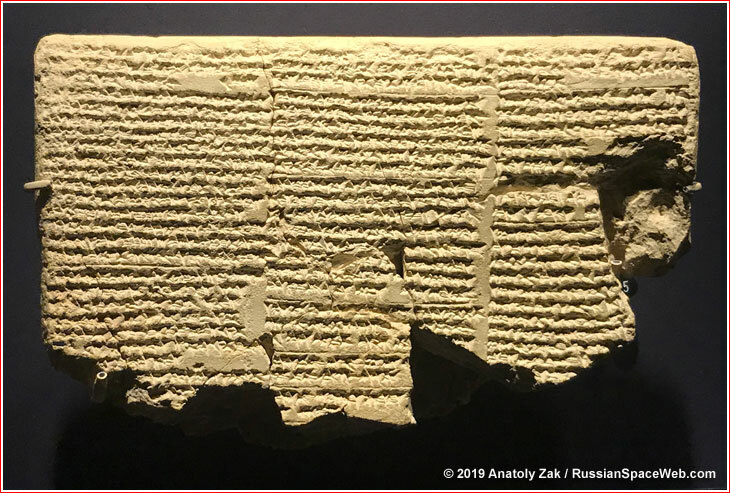 Fascinated with the Greek intellectual legacy, Caliph al-Mamun made the surrender of Ptolemy's treatise one of the conditions for peace with the besieged Byzantine Empire. The Arab version of the book then made a long journey back to the West. With the advance of Dark Ages in Europe, astronomy flourished in India, China and the Islamic World. During the middle ages, the Christian church combined an ideologically convenient ptolemaic Earth-centered system, with the naive picture of creation found in the Bible. For hundreds of years, those who challenged this grotesque world view risked torture and death at the hands of the Inquisition. As a silver lining, Christian theologians relayed to future generations a number of otherwise lost Greek notions about the Universe... in the process of refuting them as "heresies." With Copernicus' monumental discoveries, his misconceptions about planets rotating in small circles, while simultaneously moving about the sun looked really minor in retrospect. He also mistakenly placed the Sun away from the center of the circle about which planets were moving, in an effort to explain deviations in observational data. Yet, the true picture of the Solar System still had to be refined. Johannes Kepler achieved just that at the beginning of the 17th century. Ironically, despite his adherence to ideal shapes of the Universe, Kepler was the one who finally established that planets move around the Sun, not in perfect circles but on ellipses, with the Sun sitting asymmetrically at one of two "focuses" of the ellipse. Kepler also proved, with Mars as the example, that planets accelerate as they approach the Sun and then slow down as they move toward the point of the ellipse farthest from the Sun. He also correctly assumed that the life-supporting atmosphere forms only a thin mantle around the Earth and beyond it extends a deadly abyss of vacuum. Ironically, while these remarkable foresights greatly advanced human understanding of the world, they also erected seemingly unchallengeable barriers on the way of those who tried to dream of realistic ways for space travel. The invention of a practical telescope in Holland in 1608 forever revolutionized astronomy and gave the ancient science its most powerful tool. On July 26, 1609, at 9 p.m., Thomas Harriot apparently made very first astronomical observations with a telescope pointing his new "Dutch trunke" to the Moon. Harriot's drawings of the five-day old Moon showed the terminator (day and night) line. The observations had never been published. 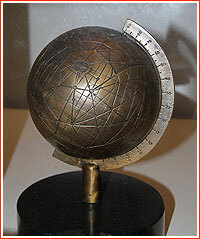 Shortly thereafter, Galileo Galilei used his own version of the device to finally prove that planets are globular worlds of various sizes, like the Earth and the Moon. In 1610, Jupiter revealed the first four of its moons to the peering power of Galilei's telescope, further expanding a list of destinations in the Solar System. Within four decades, Johannes Hevelius published a detailed topographical study of the Moon based on telescope observations, dethroning it as the sister of the Earth. Instead Hevelius presented an essentially modern image of the Moon as a lifeless, waterless body with strange ring-shaped mountain ranges. During the same century, calculations by Giovanni Cassini and other astronomers "expanded" the solar system to an astounding 80 million miles across (against an actual 93 million miles), essentially doubling the stage for potential exploration in comparison to previous estimates. Despite the Moon lost appeal as an inhabitable world, Mars and Venus were proven to have atmospheres and thus presented intriguing mysteries. At the same time, a new understanding of distances devoid of air between those worlds, solidly relegated the idea of space travel to the realm of fiction. In 1687, Isaac Newton postulated the law of universal gravitation, essentially discovering the most important mechanism for both the ancient science of astronomy and yet-to-be achieved space exploration. The concept of artificial satellite of the Earth was finally born. It took another century for Laplace to publish Celestial Mechanics, which used Newtonian principles to provide a detailed picture of the Solar System. Astronomers acquired the ability to predict the existence of unknown planets by detecting their gravitational influence on visible planetary bodies. The method was instrumental in predicting the existence of Neptune by Urbain Leverrier in 1846 and for the discovery of Pluto by Clyde Tombaugh in 1930. Following the discovery of Uranus in 1781 by William Herschel, the list of objects in the Solar System started growing dramatically during the 19th century, as the "vast gap" between the orbits of Mars and Jupiter was being "filled" with newly discovered asteroids. By the end of the 19th century, the true picture of the Solar System was finally established, just in time for the machine age to provide practical means of space travel. Still, countless ideas from the most imaginative fiction writers and the most advanced scientists were collapsing before the towering challenges of overcoming the Earth's gravity and surviving in the vacuum of space. Ironically, the dawn of the space age would ultimately rely on an invention which had been around for hundreds of years. This Mesopotamian tablet carried some the earliest known descriptions of celestial constellations, including Orion and Gemini. 2000 B.C. : The existence and movement of planets is recognized in Babylon. 1000 B.C. : The Babylonians track the movements of the Sun, the Moon and the planets and determine time of day with a sundial. ~650 B.C. : A Babylonian astronomer teaches on Kos, an island off the cost of Asia Minor, a region of active interaction between the Greeks and eastern cultures at the time. 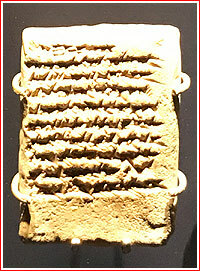 624-547 B.C. : Thales, a Greek astronomer and philosopher, lives and works in Miletus. 585 May 28 B.C. : Thales predicts a solar eclipse at a battle of Lydians and Medes. 572 B.C. : Pythagoras is born in Samos. ~466 B.C., early June - late August: A possible sighting of Comet Halley in Greece. ~360 B.C. : Heraclides of Pontus, a disciple of Plato, concludes that the Sun is the center of revolution for Mercury and Venus, but that the Sun itself revolves around the Earth. 240 B.C. : Chinese astronomers record a sighting of what is later known as Comet Halley. ~240 B.C. : Eratosthenes measures the circumference of the Earth with surprising accuracy. He also invents a system of latitude and longitude, and a calendar that has leap years. 129 B.C. : Greek astronomer Hipparchus of Nicaea catalogues the relative positions and brightness of around one thousand stars with an accuracy of about one degree thanks to the use of gnomons, astrolabes, and armillary spheres. He also created the magnitude system for describing the brightness of stars in use until today. 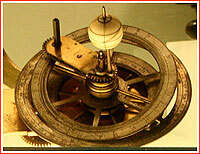 1st century A.D.: First known magnetic compass invented in China. 140-150: Ptolemy suggests a geocentric theory of the universe in his main work entitled Megale Syntaxis (Great Collection). 774-775: A powerful gamma-ray burst strikes Earth, possibly, as a result of a collision of a pair of black holes or neutron stars in our galaxy or a Sun flare. ~830: Along with a number of Greek writings, Ptolemy's Great Collection is translated into Arabic under the name Almagest for the Caliph al-Mamun. 1054: A supernova explodes in Crab Nebula. 1120-1125: One of the earliest observatories of Mediaeval Islam operates in Cairo until its patron is condemned to death for communication with Saturn and the facility is destroyed. 1259: Hulagu, a Mongolian ruler, sponsors the construction of the Maragha observatory led by the Persian astronomer Nasir al-Din al-Tusi to satisfy the ruler's belief in astrology. The facility includes a big library and numerous outdoor instruments. 1428: Ulugh Beg (1394-1449), ruler of Samarkand, initiates the construction of an observatory in the city. The center includes a circular three-floor building and many large-scale, custom-built instruments. Among them is a quadrant so large that part of the ground has to be removed to allow it to fit in the observatory. 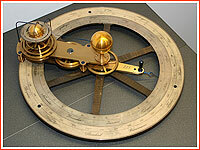 There is also a marble sextant, a triquetram and an armillary sphere. 1437: Ulugh Beg publishes a catalogue of 992 stars and brings the accuracy of the year length to 365 days, 5 hours, 49 minutes and 15 seconds. 1543: "De revolutionibus orbium coelestium" (On the Revolutions of the Celestial Spheres) by Copernicus reviving the heliocentric theory of the Universe once and for all is published. 1572, early November: Observers on Earth witness the appearance of a "new star" in the constellation Cassiopeia, an event later recognized as the brightest naked-eye-visible supernova in more than 400 years. Tycho Brahe, a Danish	astronomer, proved that the new object was among the stars, the sphere previously thought to be unchangeable. 1582: Pope Gregory XIII introduces the Gregorian calendar. 1598: Tycho Brahe completes a catalogue with the positions of about 1,000 stars thanks to the use of sextants and quadrants. 1603: In Augsburg, Germany,	Johann Bayer publishes Uranometria star atlas, which introduces a new system of star designation, using Greek letters. It is still in use today and bears his name. 1604 Oct. 17: Johannes Kepler begins systematically observing a new, very bright star that had abruptly appeared in the constellation Ophiuchus. It was later identified as a supernova. 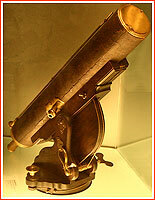 1608: In Netherlands,	Hans Lippershey and Jacob Metius independently invent the telescope within weeks of each other. 1609 July 26: Outside London, Thomas Harriot makes first astronomical observations with a telescope with a magnification of 6 and produces a sketch of the Moon based on these observations. 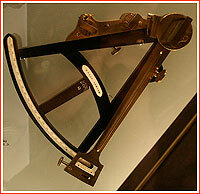 1609: In Italy, Galileo uses a telescope for astronomical purposes. He observes the Moon's craters and the Milky Way galaxy. 1609: Johannes	Kepler publishes "Astronomia Nova," containing a revolutionary explanation of planetary motions. 1609 Dec. 29: In Auerbach, Germany, Simon Marius possibly observes moons of Jupiter with a telescope. 1610 Jan. 7: In Padua, Itlay, Galileo Galilei records his observations with a telescope. He also discovers moons of Jupiter. 1611 June 13: Johannes Fabricius publishes a 22-page pamphlet, De Maculis in Sole, describing sunspots for the first time. 1612 Dec. 15: Simon Marius observes Andromeda nebula through a telescope. 1616: The Church officially outlaws Copernicus' book on heliocentric theory. 1618 March 8: Johannes Kepler	introduces the 3rd Law of Planetary Motion in his work "Harmonice Mundi" (Harmony of the World). 1627: Tycho Brahe's catalogue with the positions of about 1,000 stars is published, greately improving known accuracy of star positions. 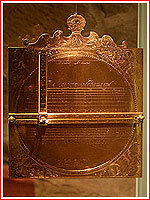 1629: Johannes Kepler predicts transit of Venus in Rudolphine Tables. 1631 Dec. 6: Venus transit takes place as first predicted by Johannes Kepler in 1629. 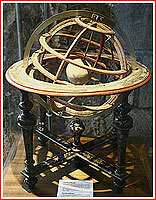 1632 Feb. 22: Galileo Galilei publishes Dialogue Concerning the Two Main World Systems (Dialogo sopra i due massimi sistemi del mondo), comparing the Copernican heliocentric system with the traditional Ptolemaic geocentric system. 1633 April 12: The Church starts a trial against Galilei forcing him to recant his views. The astronomer will spend the rest of his life under house arrest. 1633 June 22: Galileo Galilei sentenced by the Inquisition and forced to abandon his ideas that the Earth moved around the Sun. 1647: Johannes Hevelius (Michel Florent van Langren) publishes "Selenographia," a topographic review of the Moon, providing evidence that the Earth's natural satellite likely lacks air or water. 1655 March 25: In the Netherlands,	Christian Huygens discovers Titan, Saturn's fourth satellite. 1656 February:	Christian Huygens discovers Saturn's rings. 1658 March 28: Christian Huygens publicly announces the discovery of Saturn's rings. 1659: Christian Huygens notes markings on Mars. 1659 July: Christian Huygens publishes "Systema Saturnium." 1660 August: A treatise attributed to Eustachio Divini disputes Huygen's discovery of Staturn's ring, instead arguing for the existence of four satellites which create an illusion of the ring. 1661 May 3: Johannes Hevelius observes transit of Mercury, 3rd ever to be seen, recording his observations. 1664: Robert Hooke observes a huge oval feature in the atmopshere of Jupiter. 1664 December - 1665: Two bright comets are observed across Europe. 1666: Giovanni Domenico Cassini detects Martian polar ice caps. 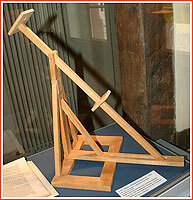 1668: In England,	Newton builds the first reflecting telescope. 1669: In Italy,	Geminiano Montanari discovers that the star Algol is not steady in brightness, thus recognizing the first variable star. 1671 Oct. 25: Italian-French astronomer Giovanni Cassini discovers Iapetus, 3rd largest of Saturn's moons. 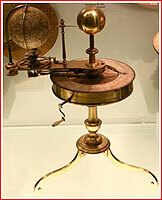 1675 March 4: A royal warrant appoints John Flamsteed to be the first Royal Astronomer. 1675 June 22: King Charles II issues a Royal Warrant authorising construction of an observatory at Greenwich, London. 1675: Giovanni Domenico Cassini discovers that Saturn's rings are split into two parts, separated by what is later known as the "Cassini Division". 1676 Nov. 9-Dec. 7: Danish astronomer Ole Romer working at Paris observatory measures the speed of light through observations of moons of Jupiter. 1680 Nov. 14: German astronomer Gottfried Kirch makes first discovery of a comet (C/1680 V1) with the help of a telescope. Kirch comet (a.k.a.Great Comet of 1680) becomes briefly visible in daylight on December 18. 1682 May 1 : In France, King Louis XIV inaugurates the Paris Observatory. 1684: Giovanni Domenico Cassini discovers Saturn’s icy moon Dione. 1687 July 5: In England,	Newton publishes his theory of universal gravitation in the work "Philosophiae Naturalis Principia Mathematica." It is later regarded as the beginning of modern astronomy. 1705: In England,	Edmond Halley correctly predicts the return of a comet (later named Halley's comet) in 1758. 1709, 1712: German astronomer Maria M. Kirch (Winkelmann) publishes research on the conjunction of the Sun with Saturn, Venus and Jupiter. 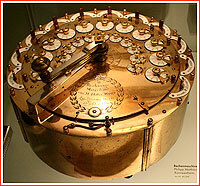 1713 March 20: The first planetarium arrives from Europe to St. Petersburg as a present to Peter the Great. Circa 1724: Maharaja Savai Jai Singh II of Jaipur builds a great observatory in Delhi, India. 1743-44: A bright comet is observed over Europe. 1758: In Germany,	Johann Palitzsch observes Halley's comet as predicted by Halley in 1705. 1761: In Russia, Mikhail Lomonosov watching transit of Venus through a small refracting telescope, notices a distortion correctly attributing it to an atmosphere around the planet. 1768 Feb. 16: Fellows at the Royal Society of London request King George III to assist in sending expedition to the southern ocean to observe the Transit of Venus the following year. 1772: French mathematician Joseph-Louis Lagrange discovers locations in space where gravitational forces and the orbital motion of a body balance each other. They became known as Lagrangian or L points and centuries later would play an important role in space exploration. 1774 March 4: Shortly after beginning its survey of the sky, William Herschel detects Orion Nebula. 1781 March 13: In England,	the German-born astronomer William Herschel uses a telescope to detect what he first thought a comet or a star. It is soon identified as a planet, later named Uranus, expanding the Solar System known to humanity for the first time since antiquity. 1781: In France,	Charles Messier catalogs 103 deep-space objects (later called Messier objects), including galaxies, nebula and star clusters, in an effort to distinguish them from comets and other transient bodies. 1781: Eise Eisinga completes a home-built planetarium in Franeker, Netherlands, the oldest surviving planetarium. 1783 Feb. 26: Caroline Herschel discovers the NGS-2360 star cluster. 1787 Jan. 11: William Herschel discovers Titania and Oberon, moons of Uranus. 1789 Aug. 28: William Herschel discovers Saturn's moon Enceladus. 1789 Sept. 17: William Herschel discovers Saturn's moon Mimas. 1801 Jan. 1: In Italy,	Giuseppe Piazzi records sighting of the first asteroid, Ceres. 1802: A second asteroid, Pallas, is discovered. 1807 March 29: German astronomer Heinrich Olbers observes asteroid Vesta visible to a naked eye. 1833 Nov. 12: The Leonids produces what is believed to be the most massive meteor shower. 1835: The religious ban of Copernicus' book on the heliocentric theory ends. 1837: Madler and Beer publish a highly accurate map of the Moon. 1838 June: In Germany, Johann Galle observes that in the ring of Saturn, a veil extends across half the dark space separating it from the planet. 1838: Catalogue of Circumpolar Stars, listing 4,243 stars compiled by British astronomer Stephen Groombridge is published. 1839 Jan. 2: Louis Daguerre takes the first photograph of the Moon. 1842: In Austria, Christian Doppler, physicist and mathematician, discovers the phenomenon later known as 'Doppler Effect'. 1843: In Germany,	Samuel Heinrich Schwabe suggests the existence of an approximately 10-year cycle in the Sun spot activity. 1846 September: At Berlin Observatory, Germany,	Johann Galle observes and discovers Neptune. His observations were prompted by mathematical calculations by the French astronomer Joseph Leverrier and the English astronomer John Couch Adams. 1846 Oct. 10: In England, William Lassell discovers Triton, the Moon of Neptune with his 24-inch reflector telescope. 1848: Edward Roche suggests that rings of Saturn are probably made of smal particles. 1851 July 28: A Russian daguerrotypist named Berkowski takes the first photograph of a solar eclipse, using an 84-second exposure. 1852: Italian astronomer Annibale de Gasparis discovers 16 Psyche, proven to be a unique metal asteroid. 1857: A Scottish physicist James Clerk Maxwell proves mathematically that the rings of Saturn consist of particles orbiting Saturn. 1859 April 2: German astronomer Ernst Wilhelm Tempel discovers his first comet C/1859 G1. 1859 September: British astronomers R. Carrington and R. Hodson observe a large solar storm. 1860-63: In England,	William Huggins begins the spectral analysis of stars. 1861: The great comet, discovered by John Tebbutt, peaked magnitude -2 with a tail fanning 90 degrees wide. The comet reportedly cast a shadow on the walls of Athens Observatory. 1862: Alvan Graham Clark makes the first observation of the white dwarf companion of Sirius, the brightest star in the night sky. 1867: English astronomer Richard Proctor produces one of the earliest maps of Mars based on 27 drawings by William Rutter Dawes. 1868: Pierre Jansen and Joseph Lockyer observe solar prominence, detecting helium, the first chemical element to be discovered in space before it was found on Earth. 1872:	In the US, Henry Draper takes the first photograph of the stellar spectrum from the star Vega. 1877 August: In the US, Asaph Hall discovers Deimos and Phobos, the moons of Mars. 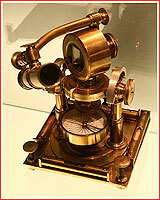 1877: In Italy,	Schiaparelli observes features on Mars, later sensationally described as "canals." 1882 September: Possibly the brightest comet observed from Earth. 1888: Scottish-American astronomer Williamina Fleming discovers the Horsehead Nebula. 1888: Danish-Irish astronomer Johan Ludvig Emil Dreyer compiles New General Catalogue, NGC, of Nebulae and Clusters of Stars, the catalogue numbers of which are still in use today. 1892 Jan. 5: German physicist Martin Brendel takes the 1st successful photograph of an aurora. 1892: E. E. Barnard discovers a fifth moon of Jupiter. 1905: Mount Wilson Observatory is established in California to study the Sun. 1908:	In Denmark,	Ejnar Hertzsprung describes giant and dwarf stars. 1911-14: Ejnar Hertzsprung and Henry Norris Russel introduce the H-R diagram that shows how the characteristics of stars are related. 1915: Albert Einstein introduces the General Theory of Relativity. 1923: In the US, Edwin Hubble shows that galaxies exist outside the Milky Way. 1924: In the US, Frank Schlesinger publishes a catalogue with the positions of almost 2,000 stars to a precision of about one hundredth of an arc second. 1927: In Netherlands,	Jan Oort shows that the center of the Milky Way galaxy is in Sagittarius. 1930 Feb. 18 - March 13: In the US, Clyde Tombaugh discovers Pluto. 1931: In	the US, Karl Jansky discovers cosmic radio waves. 1937: In the US, the first radio telescope built by Grote Reber. 1948 Feb. 16: Dutch-American astronomer Gerard Kuiper discovers Uranus' moon Miranda using the Otto Struve telescope. 1949: Physicist Enrico Fermi suggests that the highest-energy cosmic rays are accelerated in the magnetic fields of interstellar gas clouds. In the decades that followed, astronomers showed that supernova remnants may be the galaxy's best candidate sites for this process. 1949: Gerard Kuiper discovers Neptune's moon, Nereid, later confirmed as the planet's third largest satellite. 1958 Nov. 13: Nikolay Kozyrev, sees a brightening at the central peak in the crater Alphonsus on the Moon. He photographs its spectrum, which shows carbon-vapour emissions. 1959: The Soviet Luna-3 probe delivers the first images of the far side of the Moon. 1965 July 14-15: The first close-up images of Mars delivered by Mariner-4 reveal a Moon-like cratered surface. 1966: The Soviet Luna-9 probe conducts a soft landing on the surface of the Moon and sends the first images from the surface. 1974: The U.S. Mariner-10 probe transmits the first image of Mercury. 1976: A pair of NASA's Viking probes lands on Mars. 1977: Uranus' rings are discovered. 1978 June 22: In the US, James Christy and Robert Harrington discover Charon, the moon of Pluto. 1970s: Observations by Dr. Vera Cooper Rubin produced enough evidence to convince the scientific community that the vast bulk of the mass in the universe is invisible and unknown in origin and character, giving rise to the term the "dark matter." 1980: NASA's Voyager-1 transmits the first images of Saturn and its rings. 1983: IRAS infrared telescope is launched. 1985: Charon starts eclipsing Pluto enabling the establishment of the size of the planet as 2,300 kilometers. 1986: The Soviet Vega and European Giotto spacecraft deliver the first close-up images of a comet. 1986: NASA's Voyager-2 flies by Uranus. 1989 July 5: The imaging team in the Voyager project identifies the second previously unknown moon of Neptune after the flyby of the planet by Voyager-2. The natural satellite was initially dubbed 1989N2 and was later named Larissa. 1990: The Hubble Space Telescope is launched. 1991: NASA launches the Gamma Ray Observatory, GRO, later known as Compton. 1992: A special Vatican comission established by Pope John Paul II rehabilitates Galileo, previously convicted of heresy for his support of the Copernicus' theory. 1992 Aug. 30: 15760 Albion, the first object in the Kuiper Belt (or a trans-Neptunian object) besides Pluto is discovered. 1994: Comet Shoemaker Levy crashes into Jupiter. 1995 July: Alan Hale and Tom Bopp discover the Great Comet of 1997 (a.k.a Hale-Bopp comet). 1996 March 7: First photos of Pluto's sourface made by Hubble Space Telescope are released. 1999: NASA launches the Chandra X-ray Observatory. 2000: The NEAR spacecraft reaches asteroid Eros. 2000: NASA publishes evidence of recent water on Mars found in photos from Martian orbit. 2002 August: Matthew J. Holman, John J. Kavelaars, Tommy Grav, Wesley C. Fraser, and Dan Milisavljevic discover moons of Neptune Laomedia, on August 13, and Halimede on August 14, by using images taken by the 4.0-meter Blanco telescope at the Cerro Tololo Inter-American Observatory in Chile and the 3.6-meter Canada-France-Hawaii Telescope in Hawaii. 2003 Aug. 29: The moon of Neptune, Psamathe, is discovered with a ground-based telescope. 2006 Feb. 22: NASA confirms that Hubble Space Telescope discovered two additional moons orbiting Pluto. They are later named Nix and Hydra. 2006 Dec. 27: Russia launches the European Corot observatory to search for planets outside the Solar System. 2011: An exo-planet located in a potentially habitable zone around its host star is detected by NASA's Kepler space telescope. 2011 September: Observations made by the Magellan telescope allowed to detect two tiny moons of Jupiter, bringing a number of the planet's natural satellites to 66. A pair of one-kilometer bodies make one orbit around its host planet in 580 and 726 days. 2013: Neptune's smallest moon (S/2004 N), estimated at 34 kilometers in diameter and later named Hippocamp, is discovered. It is believed to be a fragment of its larger neighbor Proteus. 2017 Feb. 22: NASA announces that the Spitzer orbital observatory had discovered seven Earth-size planets in a star's habitable zone, the largest batch ever seen. Called TRAPPIST-1, the system lies only about 40 light-years (235 trillion miles) away. 2017 Oct. 19: The Pan-STARR-1 telescope based on the Haleakala volcano in Hawaii detects the first interstellar asteroid (a 400 by 40-meter rock named Oumuamua or "scout" in the Hawaiian language). 2018 Oct. 1: A team of astronomers led by Scott Sheppard announces the discovery of an object on the edge of Solar System (65 - 2,300 AU from the Sun) designated 2015 TG387 Goblin with a 8.2-meter Japanese Subaru telescope on Mauna Kea, Hawaii. 2018 Nov. 14: An international team of astronomers announces the discovery of the frozen and dimly lit exoplanet at least 3.2 times as massive as Earth orbiting Barnard's star, the closest single star to the Sun, every 233 days. The finding was made with a wide array of telescopes around the world. 2019 April 10: First photo of a black hole is released.